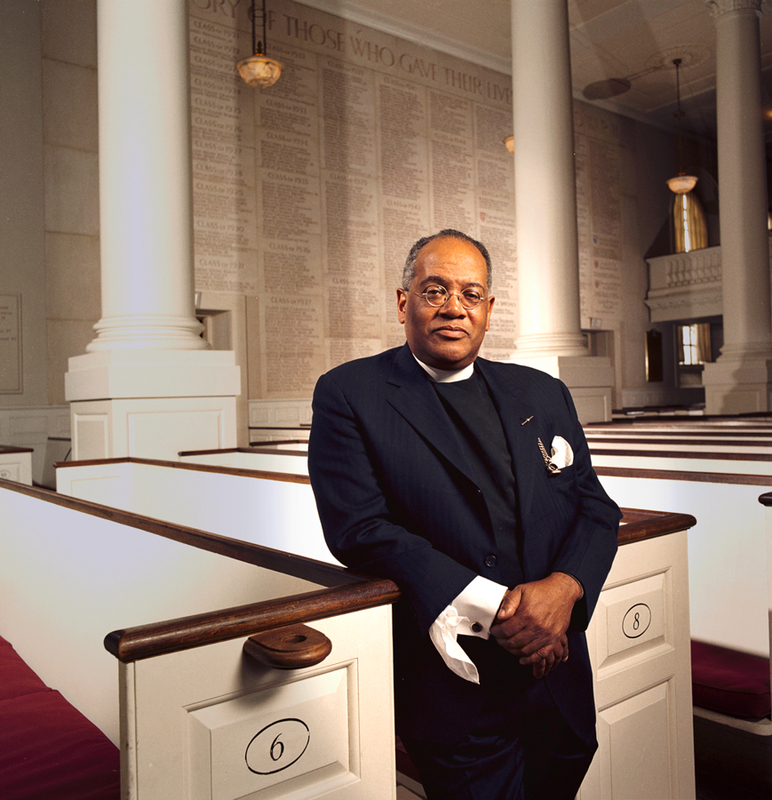 A throng of almost a thousand gathered at Harvard’s Memorial Church on the morning of April 6 for a service celebrating the life and ministry of the Reverend Peter J. Gomes. A vibrant presence in the University community for more than 40 years, Gomes died on February 28 from complications of a stroke suffered in early December. He was 68. The church seats about 900 persons and was filled to capacity for the hour-and-forty-minute service. Folding chairs were set up in the aisles and in the Memorial Room, adjacent to the auditorium, to accommodate those who could not be seated in the pews. The service included choral music by the University Choir and addresses by President Drew Faust, President emeritus Derek Bok, and Massachusetts governor Deval Patrick ’78, J.D. ’82. The ceremony was conducted by the Reverend Preston B. Hannibal, canon for academic ministries at the National Cathedral in Washington, D.C., and associate minister in the Memorial Church from 1986 to 1995; the Reverend Wendel W. Meyer, acting Pusey minister in the Memorial Church; and the Reverend Dorothy A. Austin, Sedgwick associate minister and chaplain to the University. The scripture lessons were read by Janetta C. Randolph, executive assistant to the minister in the Memorial Church; Daniel A. Sanks, M.P.A. ’02, the church’s former executive director; and Preston N. Williams, Ph.D. ’67, Houghton professor of theology and contemporary change at the Divinity School. Governor Patrick’s address was the longest of the three. “He firmly planted his spirit and his tastes in whatever disparate places suited him, mindful of what others thought, but entirely and stubbornly on his own terms,” said the governor. “By refusing to be put in anybody else’s box, Peter Gomes may have been the freest man I have ever known. The musical component of the service included Gomes’s own setting of the song “This Is My Father’s World,” sung by Kent Montgomery French, M.Div. ’07. An accomplished pianist and organist, Gomes is credited with the composition of three hymn tunes in the current edition of the Harvard Hymnal. Other musical selections included John Knowles Paine’s Harvard hymn, “Deus Omnium Creator”; the hymns “Great Is Thy Faithfulness,” “The Day Thou Gavest, Lord, Is Ended,” and “For All the Saints”; and the anthems “Light’s Glittering Morn Bedecks the Sky,” by Horatio Parker, and “When the Perfect Comes,” by Carson P. Cooman ’04, composer in residence at the Memorial Church. At the organ were Edward E. Jones, Gund University organist and choirmaster, and Christian Lane, assistant University organist and choirmaster. In a final announcement, acting Pusey minister Wendel Meyer reported that Gomes’s name will be attached to the church’s new C. B. Fisk organ, to be installed later this year. Of the organ’s $6 million cost, Meyer stated, two and a half million still remains to be raised. Internationally known for his preaching, and the author of six best-selling books of biblical interpretation, Gomes came to the Memorial Church as assistant minister in 1970. He was appointed Pusey minister in the Memorial Church and Plummer professor of Christian morals four years later. A member of the Divinity School faculty as well as the Faculty of Arts and Sciences, he held honorary degrees from 39 colleges and universities. The Memorial Church held a day-long vigil for its late minister on March 3. His funeral was held five days later at the First Baptist Church in Plymouth, Mass., where he was raised and where he owned a house built in 1899. His remains were interred in a family plot in the Vines Hill Cemetery in Plymouth. To remember Gomes, the University Gazette posted a gallery of 38 images from the minister's life. See also this tribute by Robison professor of business administration Nancy F. Koehn, who recalled that Gomes served as a spiritual adviser at a critical time in her life, and the Gazette and Boston Globe coverage of the memorial service.